I am taking a little break today from my regular posts to talk about a very special person who was very near and dear to my heart who passed away this morning and that is my Bubby Green. Words cannot really explain how special she was to me and how much I love her! It is a great loss for me and her family who all loved her so very much. I haven't been able to hold my tears back ever since getting the news this morning. 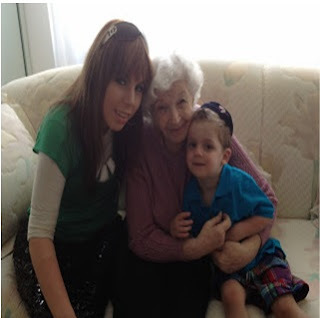 She was an amazing grandma! I am thrilled that I was able to see her and hug her and tell her how much I love her just a few weeks ago when I was visiting in Florida. I didn't know it would be the last time at the time and thinking about that makes me so sad. She passed away peacefully and that does offer a little comfort but she will be missed so much by us all. Something special about my Bubby is how great of a listener she was. She always made time for me and whenever I called she would listen and help and care. She loved her children and grandchildren so much and she was so proud of them. Her boys were her world. I am wearing the gorgeous gold star necklace today that she gave to me when I turned 12. It hangs close to my heart where she will always be. I love you Bubby Green and I always will. I miss you so much! You were the best grandmother to me and I will never forget that! I'm not sure when I will be back with another post as I feel like I need some time away to mourn.